Popped a string in a Sat. ALTA playoff match & needed it restrung for Sunday's semis. Guts & Glory Tennis... - Charles H.
When it has to be NOW, our "Knot NOW!" service is designed especially for you. This convenient service is available M - TH by appointment only. 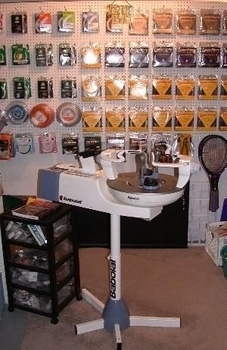 Local customers can call us at 404-926-6060 and we will schedule a personal stringing appointment. At your scheduled time you may drop off your racquet and enjoy the area shopping attractions and restaurants at Suwanee Town Center which is conveniently located within a five minute walk of our stringing workshop. Within 30 - 60 minutes your fully vitalized racquet will be complete and ready for pick up. Alternatively you can join us in our workshop and witness the magic as we give your racquet the premium service to make it perform at optimal levels for you. You will be walking out the door with a freshly strung racquet in hand in well under an hour. If our schedule does not allow stringing within the timeframe you need, you may want to consider using our emergency stringing service fee to have the work performed. Note that Emergency Services does add a surcharge of $10.00 labor when utilized. Remember, when you are in need of instant stringing gratification, our response to you is "Knot NOW!"